The Standard Length Adjustable DogLeggs have helped treat and prevent countless elbow hygromas. Each pair is designed to provide padding and coverage of the elbow without limiting the animal’s range motion. 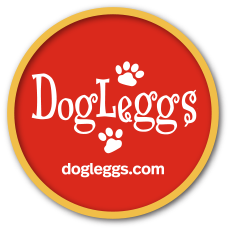 In order to ensure that your pet is comfortable and that the product functions as it should, follow these tips and tricks in applying and using your DogLeggs. It is best to fit the DogLeggs when your pet is in a standing position. The Velcro ® adjustment over your pet’s back should be loose enough that the cuffs around each leg hang slightly below your pet’s elbows while he/she stands. To test the setting of that strap, instruct the animal to do a "push-up": go from standing, to a "sit", and, finally a "down". As the dog lies down, the cuffs should slide up the forelimb and cup the elbow in the protective sleeve. The chest strap is provided to prevent the over-the-shoulder portion of the DogLeggs from sliding out of place as the animal lies down. Because the elbow covering slides when your dog stands, the cuff should not be fastened too tightly. Fastening a cuff tightly against the skin may irritate the dog, so a soft touch is best when Velcro-ing the straps that position the cuff. Once you have found the perfect positioning of the straps for your dog, it may be helpful to mark the DogLeggs to help in their reapplication. We've found silver sharpie or nail polish can leave a lasting mark that makes putting on DogLeggs quick and easy! Sometimes, the strap that lies across your pet’s back might slide forward over his/her neck and head. This typically happens when the product is new and therefore the material is stiffer. If you run into this problem, we suggest using a Surgi-Sox Torso with Leggings to apply over the DogLeggs, allowing the material to soften as it wears in. Some dogs, due to their physical build, are able to slip out of their DogLeggs. Usually this occurs in "whispier" breeds like greyhounds, and those with shorter legs. This problem can be remedied by the addition of Surgi-Sox Torso with Leggings, with mild compression, which can ensure the correct placement of the elbow padding, in most cases. This addition is especially beneficial in multi-dog households, where play can get rough. We know that dog hair gets all over everything! A lint roller or duct tape helps remove this hair. If your dog’s hair gets stuck in Velcro ® especially easily, a flea comb may be helpful. If you are using DogLeggs as coverage over an open wound, use a feminine light day napkin on the inside of the cuffs to keep the wound clean and limit discharge. To increase the longevity of your DogLeggs, we recommend laundering them as frequently as once a week. DogLeggs are machine washable, but we do recommend using a "delicates" setting. Fasten all Velcro ® closures before laundering the product to ensure that it does not catch on other materials in the wash. A garment bag may also be helpful in preventing the Velcro ® from catching on other items. Remove as much hair and debris as possible before washing to prevent the hair from becoming further embedded in the product. To dry your DogLeggs, hang them, use a “low-heat” setting, or pin them up in front of a fan. If you have any questions or are in need of any assistance in using your DogLeggs, please don’t hesitate to call us at 1-800-313-1218.